A stoppage-time goal saw Eastbourne Borough squeeze through to the last eight of the Sussex Senior Cup in a nervily tight encounter with Horsham on Tuesday night. The tie had kicked off twenty minutes late at Culver Road, with several players caught in choking rush-hour traffic, but by the final dramatic minute of an absorbing evening, Borough must have felt like the commuter dashing for the Underground train and almost getting stuck in the doors. The game was goalless, and seemingly headed for extra time, with the ten-man Hornets clinging on, when Kane Wills launched the pass of the night from half-way, dipping in behind the centre-backs. Substitute Lloyd Dawes took it sideways, drew despairing keeper Josh Pelling and slid home the winner. After a night of near misses – and some wild misses – the game had been finally clinched by a proper goal. 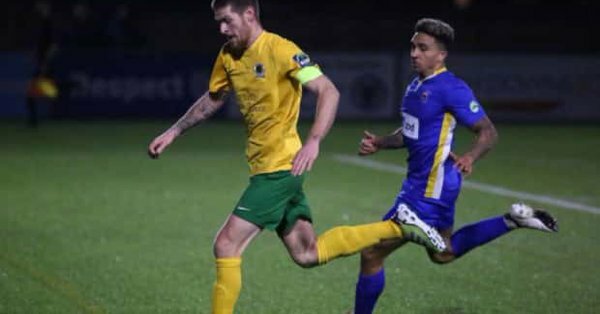 But Horsham supporters would point to an equally crucial turning point, just past the hour mark, when their striker Kieran Laverty landed a reckless studs-up challenge on Sergio Torres’ shin, and referee Jacob Miles had only one option: a straight red card. Afterwards Hornets manager Dominic di Paola wondered aloud whether his side would have won the tie with eleven men in that final half-hour. Who can say? But di Paola must also be reflecting that his side’s best chances of victory possibly came, and went, during a dominant first half. The home side missed several chances before half-time and Borough could not have complained at a 0-2 or even 0-3 scoreline. But by the time of Lavery’s dismissal, Horsham were losing momentum and the Sports were closing in to clinch the tie. The margins were fine, and Jamie Howell was just glad to get through. “We lacked a bit of sharpness, and we were just a little bit leggy perhaps. We do play a high-paced game and it is quite challenging to keep that standard up for ninety minutes twice a week. The first half was an odd contrast of styles. From only perhaps 30% of possession, the Hornets forged more actual scoring chances, while Borough’s neat and patient interplay often lacked an end product. After Tobi Adebayo-Rowling had almost grabbed an early lead, pinging a shot just wide from Adam Liddle’s wonderful cross, Horsham responded with four excellent scoring chances, all either blocked or blazed wide. And as the game opened up, Andrew Briggs tested Pelling with a drilled 25-yarder, and Harry Ransom headed too high from David Martin’s cross. All to play for then, in the second half, and Howell introduced Kristian Campbell off the bench into the left-back slot, where Cavalier Kris was to tear Horsham apart throughout the forty-five minutes, with his pace, control and enterprise. An effective gambit. Striker Rob O’Toole missed a decent chance for Horsham, but his teammates were not the same marauding force they had been earlier, and Lavery’s red card – followed swiftly by a yellow for a crude Steve Metcalf challenge – signalled the Hornets had lost their sting. Dawes replaced the hard-working Charlie Walker and the Sports were now dominant. Tom Gardiner headed wide from a free-kick – in fairness, the centre-back’s only error of the night – and Joel Rollinson almost caught Pelling with an inventive floated effort. Then another fine Gardiner header, from a corner, was touched on to the crossbar by Pelling and Campbell could not quite net the rebound. Past the 90 minutes mark, Torres knocked wide from a beautifully conjured Campbell delivery, and we began to muffle up the scarves and coats for an extra half-hour. But then up popped Dawesey, and the tie was lost and won. Borough: Smith[ Adebayo-Rowling, Gardiner, Ransom, Martin (Campbell 45); Rollinson, Torres, Wills, Briggs (Hall 80); Liddle, Walker (Dawes 76). Unused subs: Cox, Earl.